Christmas and candlelight are a beautiful duo during the Christmas season. Especially when they create magic on a simple, yet elegant tablescape. 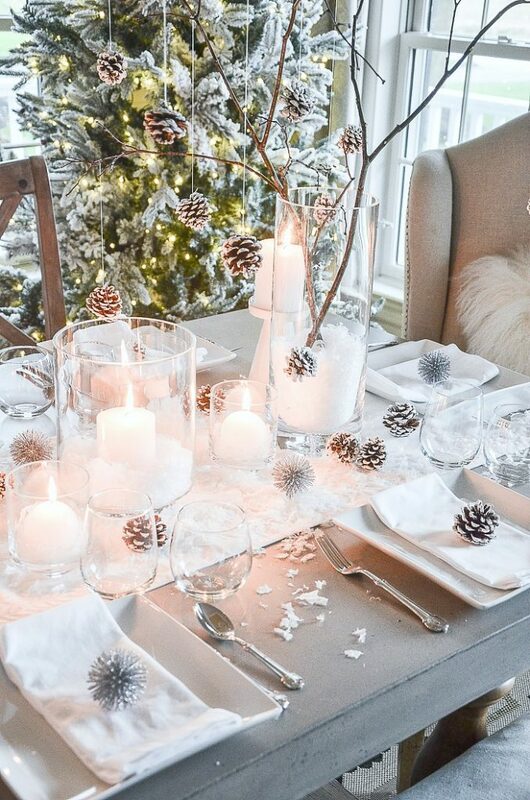 Very soft and monochromatic this Christmas table is like a walk in the woods on at Christmastime by candlelight! Welcome! 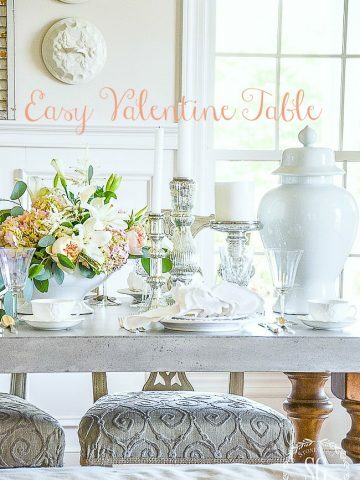 If you are stopping by from Craftberry Bush I’m sure you are full of Lucy’s beautiful table ideas! 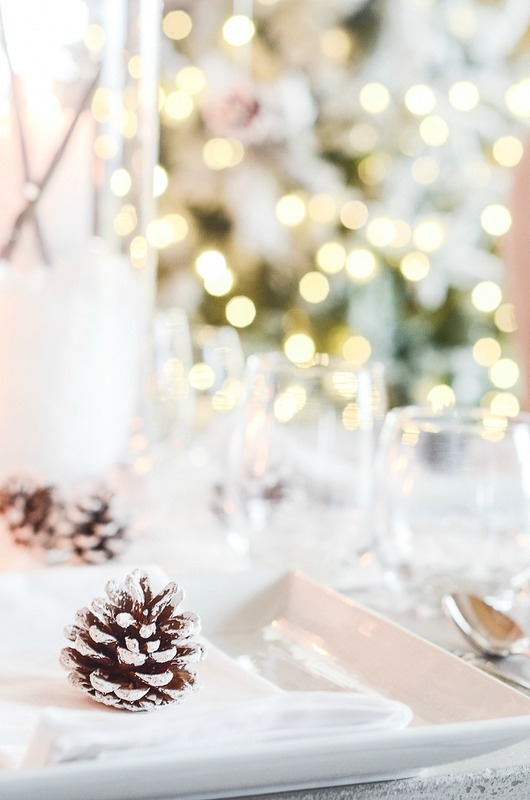 Welcome to STYLED AND SET the Holiday Entertaining Blog Tour. 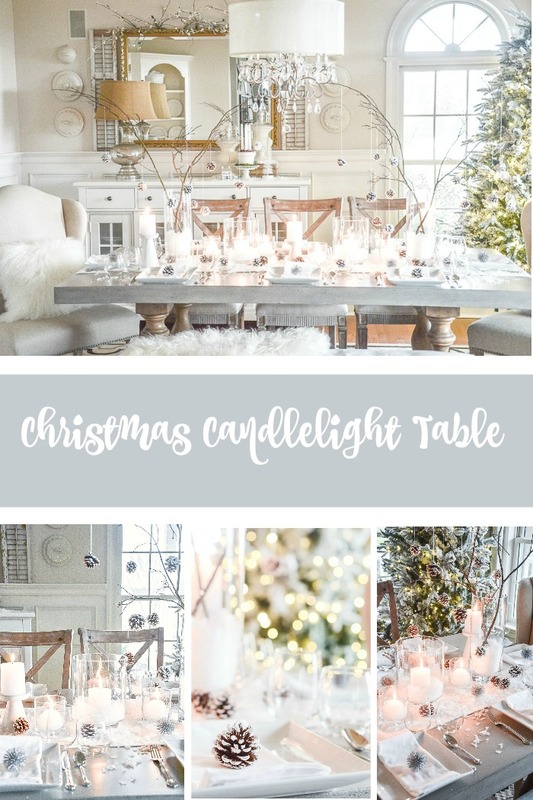 A big thanks to Lory at Designthusiam for putting our tour together and featuring some of the most brilliant tablescapers in all of blogland! Make sure to see all the creative tables at the bottom of this post. 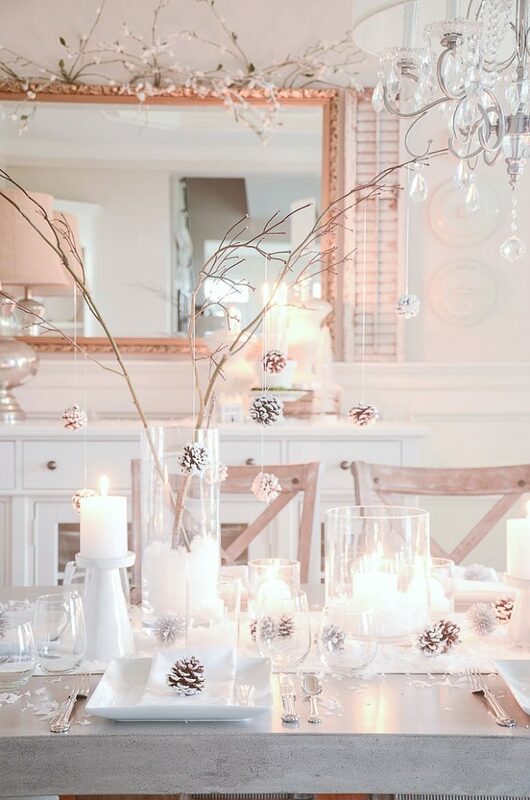 The day is dark and dreary just perfect for adding lots of beautiful candles to a Christmas table! This table was very easy to set. 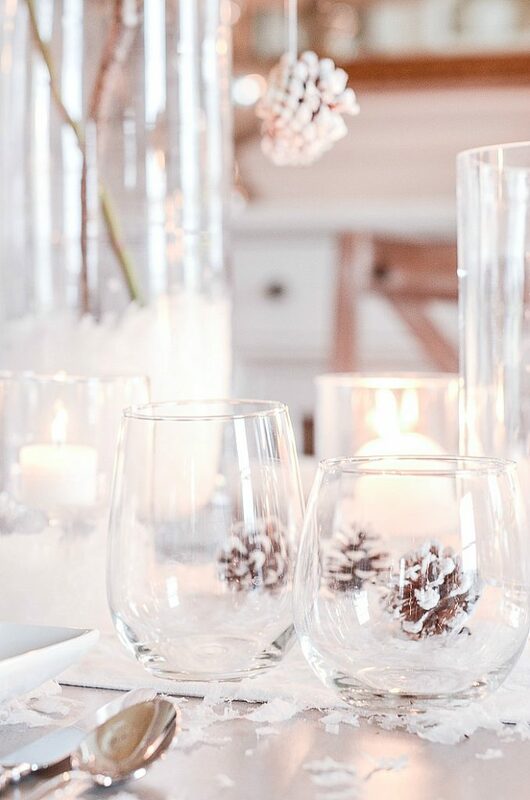 Lots of glass hurricane candleholders and snow and very simple settings. It has a modern feel with soft edges!n And even softer colors! 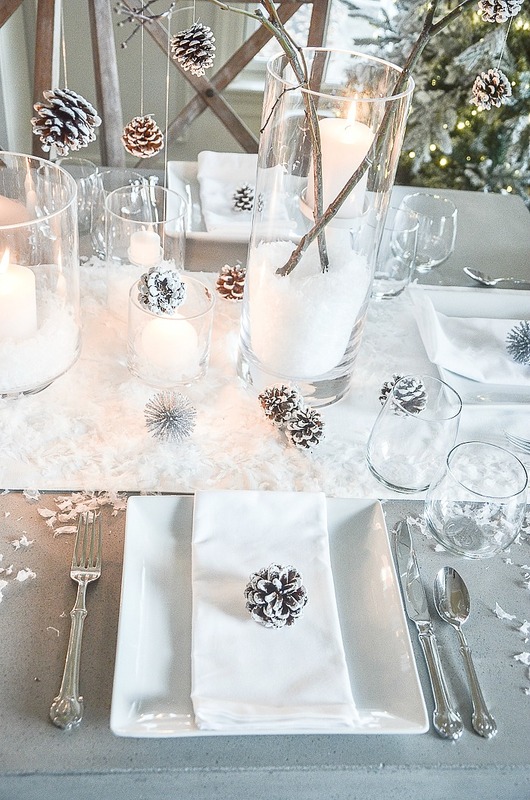 Simple white square plates, white napkins, and everyday stainless steel flatware. 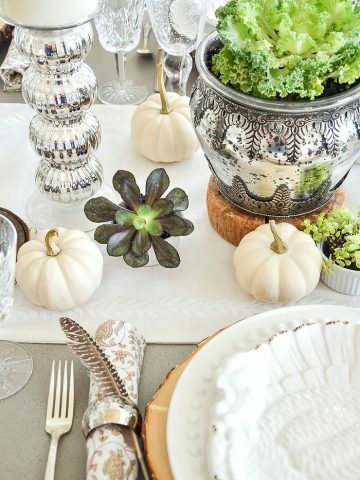 Here’s my rule of thumb when setting a table… the more complex the centerpiece the simpler the place settings. Even the wine and water glasses are sleek and clean-lined. 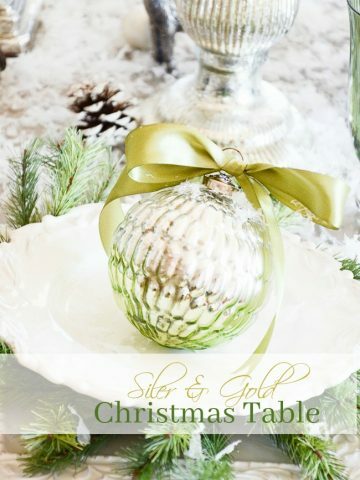 Each place setting is topped with a simple little pinecone or a sparkly silver spiky ornament. 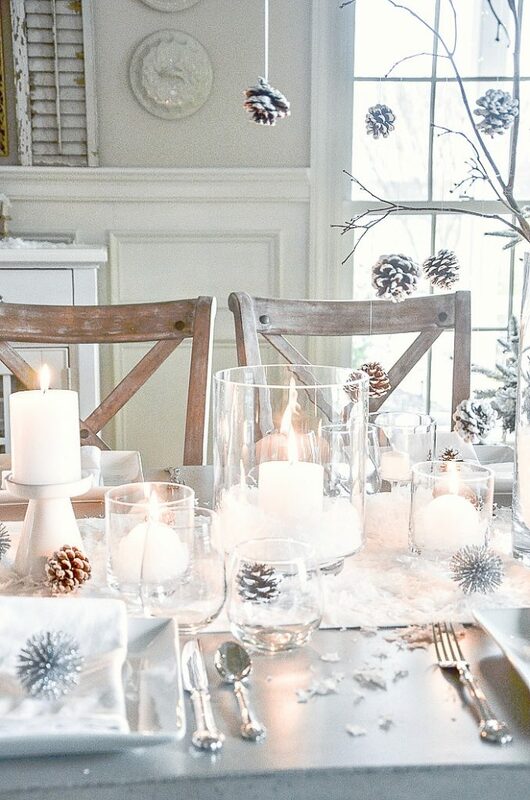 The center of the table is filled with candles and pinecones! Lots of them! And just a little sparkle of silver balls. 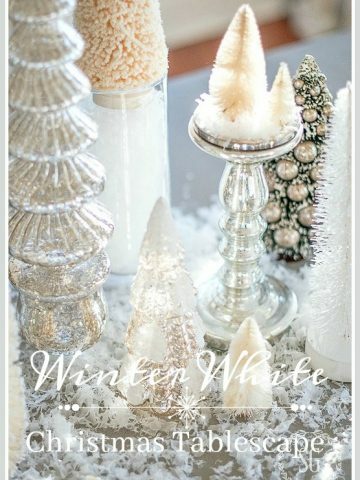 Tall glass cylinders filled with faux snow hold branches cut from the side yard. Pinecones hang from their branches. Thanks so much for stopping by to see my ethereal Christmas tablescape. Now please stop by my friend Lory’s at Designthusiam. I just wanted to say that I miss you on the podcast. You really contributed a lot! I hope that someday you will be able to do some sort of audio decor show again. You are very good at this. Happy Decorating! Breathtaking, Yvonne! Just lovely. So simple but elegant! Yvonne, this is stunning! 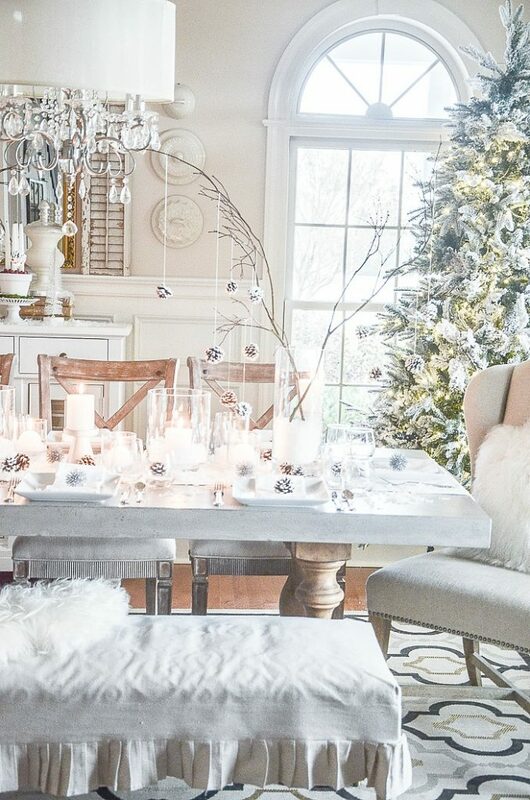 I love all the winter white details and how you hung the pinecones. So beautiful. Yvonne, this truly is a gorgeous winter wonderland!! I’m loving all the white and stunning candlelight, but also those charming pine cones!! Just perfect! 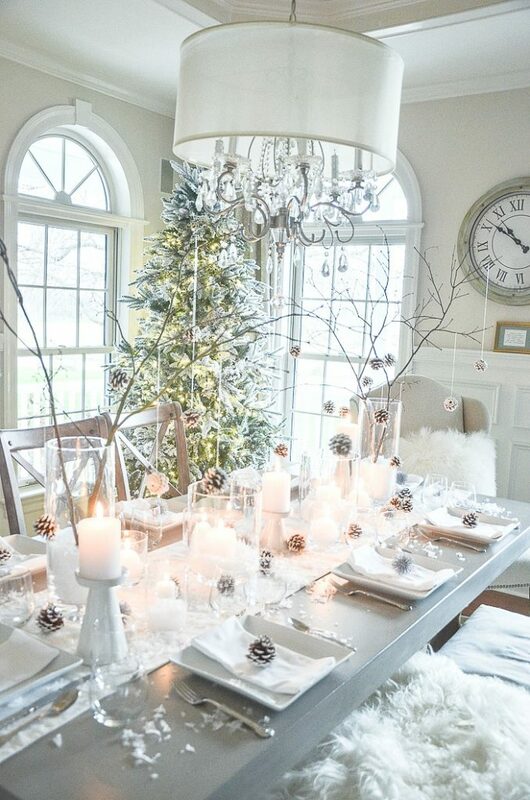 Lovely,I especially love the Christmas tree ! 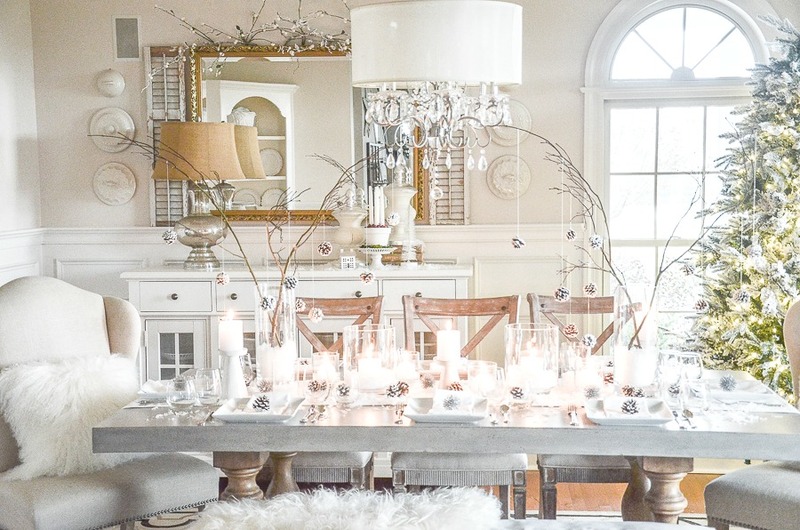 What a lovely tablescape, Yvonne….Magical! Looks like a beautiful snowy escape! Just gorgeous! And easy to create too, Cathy Ann! 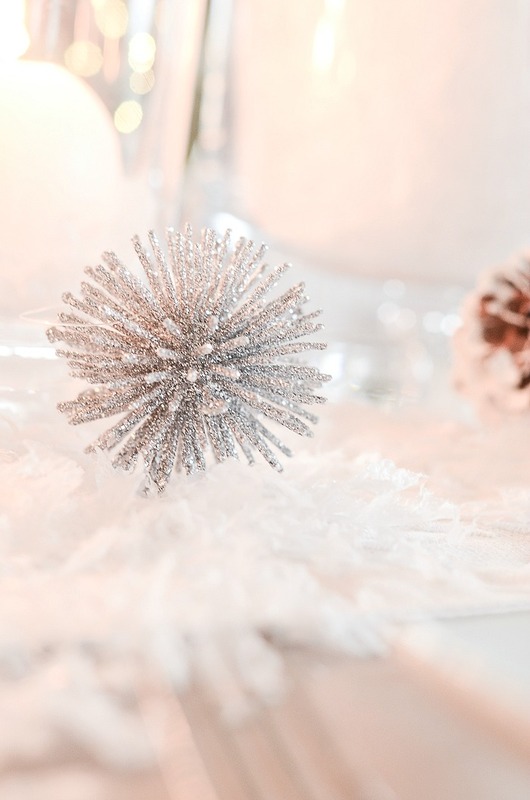 I’m in love with the branches and the hanging pinecones Yvonne! Anyone can do this regardless of budget! 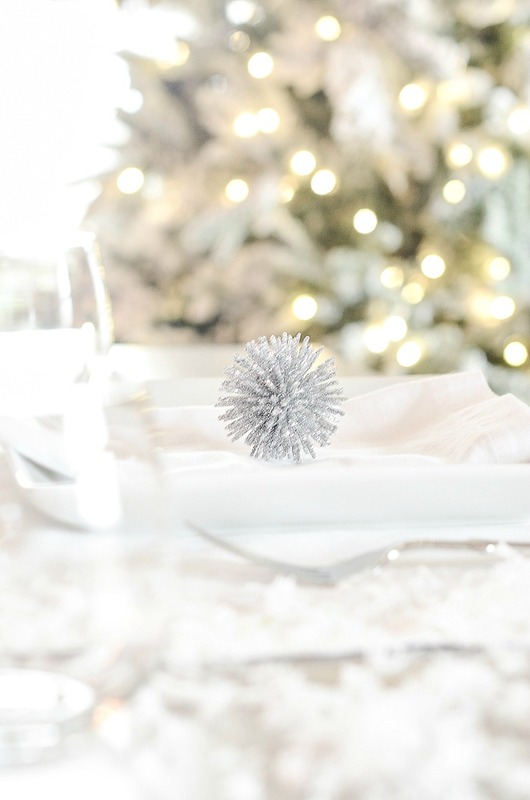 Your tablesetting and Christmas tree is positively elegant and doable. I also LOVE your table. I have been looking for something like that for some time. Can you share with me where you purchased it? The table came from Ballard Design, however, I just looked and don’t see it. You might want to look on Wayfair. They often carry things once a company no longer does. Hope this helps.